Huber Heights Board of Education members Kelly Bledsoe (left) and Mark Combs (right) were honored by the Ohio School Board Association for 10 years of board service. Sydney Brooks (right) was presented a certificate by HHCS Superintendent Sue Gunnell for coming in second place in the Huber Heights VFW Post #3283’s Voice of Democracy competition. 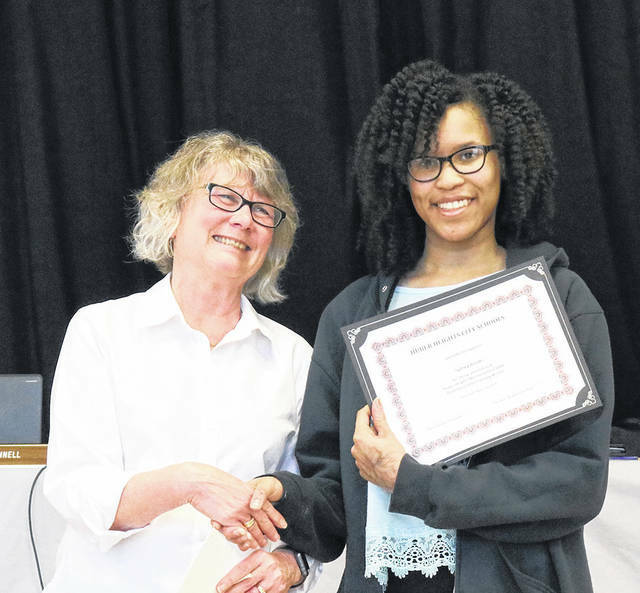 Valery Cooper (right) was presented a certificate by HHCS Superintendent Sue Gunnell was recognized at the March Board of Education meeting for advancing to the Regional Qualifying round for the Power of the Pen competition. HUBER HEIGHTS — Student accomplishment was center stage at the March 14 meeting of the Huber Heights Board of Education. 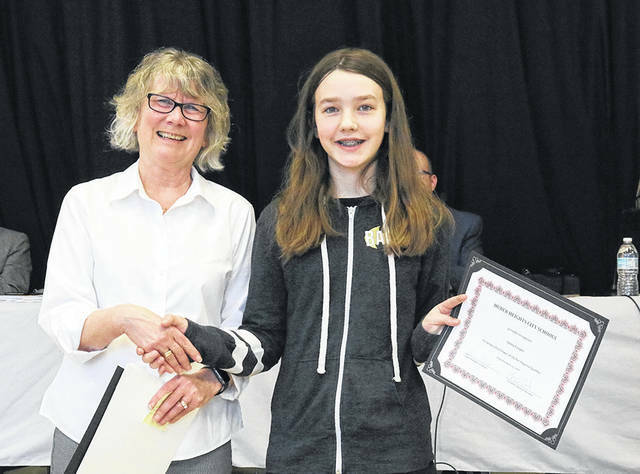 Valery Cooper, a seventh grade Weisenborn Junior High student, was recognized for advancing to the Regional Qualifying round for the Power of the Pen competition. Valery will compete at Wittenberg University to qualify for state competition at the College of Wooster. Sydney Brooks, a Wayne High School senior, was recognized at the March Board of Education meeting for coming in second place in the Huber Heights VFW Post #3283’s Voice of Democracy competition. Abigail Kerestes, a senior at Wayne, was honored for winning the state VFW Voice of Democracy competition and for placing 11th out of 53 participants on the national level. Kerestes was also honored for placing first in the Montgomery County Drug Free Coalition Poster and Poetry Contest. 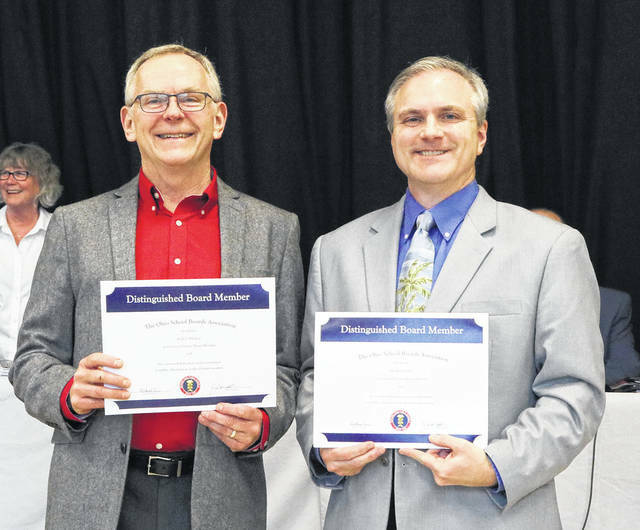 Additionally, two Board of Education members were recently recognized by the Ohio School Board Association for 10 years of service. Kelly Bledsoe and Mark Combs were honored at OSBA’s spring conference and also presented certificates at the March board meeting by Superintendent Sue Gunnell. During the business portion of the meeting, the board approved five donations: $175 from the Huber Heights Athletic Foundation (HHAF) to Wayne High School for the Glen Helen Rapta Center exhibit; coats, hats, and gloves from Sulphur Grove United Methodist Church; $77.10 from Coca Cola Company for students of Charles Huber Elementary; $5,752 from the HHAF for the Wayne track team to travel to Charlotte, NC; and a donation of a Hoyer Lift valued at $700 for use in the Nursing department. The board also approved the travel of the Wayne Air Force Junior ROTC to travel to Richmond, KY; adopted fees for the 2019 summer school programs; the summer nutrition program, and readings of several board policies. The Huber Heights Board of Education will hold its next regular meeting on Thursday, April 11 at 6 p.m. at Wayne High School.